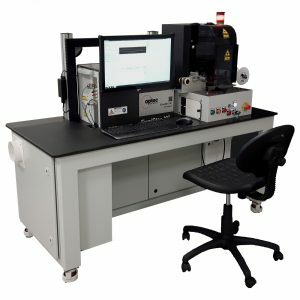 Optec Laser Systems has released the first compact, excimer laser wire-stripping workstation specifically designed for fine-wires. The ECHO 360, with its propriety “Echo” technology, strips, separates and/or cuts wires as fine as AWG 60 gauge, without handling or rotation of the wire. The deep-UV (193 nm and 248 nm) excimer wavelengths are absorbed more readily by a wider variety of insulator materials than longer wavelength lasers, for residue-free removal without damaging the conductor. Its “flat-top” beam profile provides perfect stripping uniformity and sharp transitions (edges) from insulator to core. The ECHO 360 incorporates a new generation of small-format excimer laser that delivers well over 1 billion shots, on average, between factory-service intervals. The Echo 360 can be configured for reel-to-reel or reel-to-cut stripping and multi-filar separation. Intuitive software control, on-board diagnostics and a color, touchscreen display insure consistent quality with minimal training and maintenance.